Being a largely Catholic country, many people go to Midnight Mass or La Misa Del Gallo´ (Mass of the Rooster) So named because a rooster is supposed to have crowed the night Jesus was born. Many Spanish famlies eat their main Christmas meal on Christmas Eve before the church service. The Spanish Christmas Eve Dinner varies between regions, but a popular one is ´Pao Trufado de Navidad´ which is turkey stuffed with truffles. Lamb is also very popular throughout Spain. In Galicia, you will find that seafood is the most popular meal - in fact seafood is popular in many areas. This is mainly made up of shellfish. 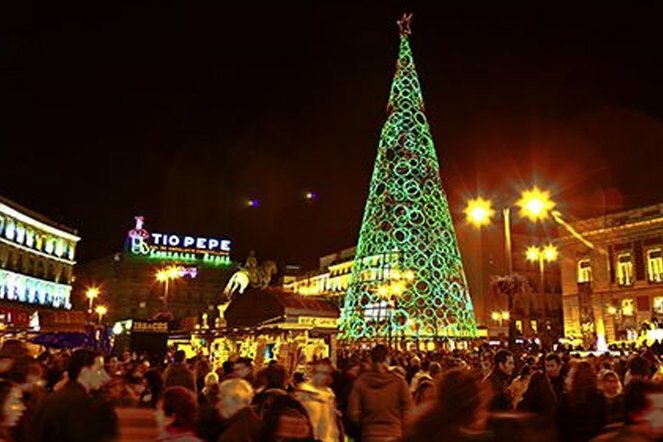 The way to greet people in Spain varies across regions: In Spanish Happy/Merry Christmas is 'Feliz Navidad'; in Catalan it's 'Bon Nadal'; in Galician 'Bo Nadal'; and in Basque (or Euskara in basque) 'Eguberri on'. December 28th is 'Día de los santos inocentes' or 'Day of the Innocent Saints' and is very similar to April fools day in England. People try to trick each other with silly stories and jokes, and if you manage to trick someone you call them 'Inocente, inocente' which means 'innocent, innocent'. New Year's Eve is called 'Nochevieja' or 'The Old Night' in Spain and one popular tradition, is to eat 12 grapes on each bong of the clock striking midnight- if you can finish all of your grapes, this is said to bring luck for the following year! The Spanish traditonally give their presents on the 6th of January - on Epiphany - called 'Fiesta de Los tres Reyes Mages': in English this means 'The festival of the three Magic Kings'. This day celebrates the day that the wise men brought presents to the baby Jesus. Many children write a list of presents on 26th December, with the toys and presents they want. Like in England, children often leave a glass of brandy or sherry, and food for the Kings. Also-as in England-children are warned to expect very little if they have been bad - usually a lump of coal! Many large towns have floats where the kings ride, and throw sweets to the children below. Gaspar - King of Sheba - has brown hair and a brown beard. He wears a green cloak and gold crown. He represents the Frankincense brought to Jesus. Melichior - King of Arabia- has white hair, and a gold cloak, and represents the gold brought to Jesus. Balthazar - King of Tarse & Egypt - represents the gift of Myrrh brought to Jesus. Myrrh is a perfume that was traditonally put on dead bodies to hide the smell - it symbolised that eventually Jesus would suffer and die. Many Spanish eat a special cake called a ´Roscón´ at Epiphany. Roscón literally translates as ´ring shaped roll´ It is usually filled with Cream, and contains a little gift - so be careful when biting into a slice! !